You’ve always known that your little girl was destined for greatness. From the very moment she uttered her first word, to the first triumphant steps she took when she learned to walk. You knew that she had what it takes to do just about anything, like stand against the forces of evil that threaten the galaxy. Why… she could even become a Jedi with a little bit of training. Well, maybe it’s time you began training her in the ways of the Force. Just as Rey begins heeding the teachings of Luke Skywalker in The Last Jedi, perhaps it’s time for you to show your little one the ways of the Force. Now, you don’t need to take her to some backwoods planet in the middle nowhere, like Ahch-To. All you need is this licensed Star Wars costume. This child deluxe Rey costume is inspired by Daisy Ridley’s outfit from The Last Jedi. 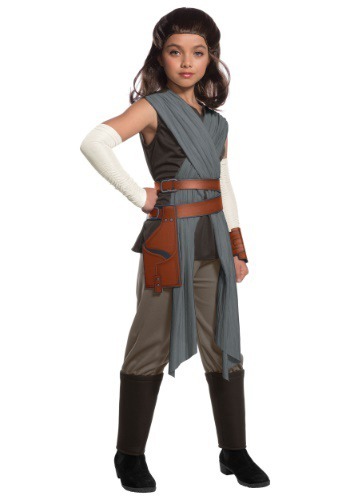 It comes with a top that has attached wraps for heroic, yet humble look befitting of any young Jedi in training. It also comes with a pair of pants with attached boot covers for convenience, along with arm warmers and a belt. The only thing you need to do is help her find a lightsaber and begin training her how to defend herself from bad guys like Kylo Ren. With plenty of adult Star Wars costumes to choose from, you can stand by your young little Jedi’s side as you head out on adventures in the galaxy.